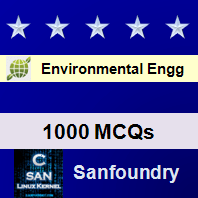 This set of Environmental Engineering Multiple Choice Questions & Answers (MCQs) focuses on “Desalination”. 1. Which of the following method is not used for desalination? Explanation: Coagulation is not used for desalination. It is done for removing the suspended impurities from water. 2. Which of the following is not a type of distillation plant? Explanation: Tube settler is not a type of distillation plant. It is used for shallow depth sedimentation. 3. Multistage flash evaporator produces _____ kg of water per kg of prime steam. Explanation: Multistage flash evaporator produces 20 kg of water per kg of prime steam. They operate on the brine recycling basis. 4. Which of the following is the best evaporative desalinating method? Explanation: Multistage flash evaporator is the best evaporative desalinating method in which efficiency of multistage flash evaporator can be further improved by the use of flash enhancers. Explanation: Multistage flash evaporator uses 69 stages in the desalination process. The vapors released during flash each stage condenses to heat the incoming sea water and gives fresh water. 6. Which of the following desalination method is more suitable for brackish water than sea water? Explanation: Reverse osmosis is more suitable for brackish water than sea water. In this process, some part of water permeates the membrane and is collected as fresh water while the remaining water passed through the turbine for recovery. Explanation: The process in which the brackish water is forced across a permeable membrane by mechanical forces is called as hyper filtration. The pressure applied must be greater than the osmotic pressure. 8. In which desalination process, the salt ions are removed from seawater by means of electric current? Explanation: In Electro dialysis, the salt ions are removed from seawater by means of electric current where two membranes are used- one who is more selective to anode and another who is more selective to cathode. Explanation: In Electro-dialysis, the passage of electric current helps the diffusion of cation and anion permeable membrane and the energy required is directly proportional to the concentration of salt in the saline water. Explanation: Electro-dialysis is suitable for brackish water with a total concentration of salt up to 5000ppm and leaving 100ppm in the treated water. 11. In which desalination process, the cooling of sea water is done to obtain fresh water? Explanation: In freezing method of desalination, cooling of the water takes place to obtain fresh water by separation of the ice and brine liquor. 12. State whether the following statement is true or false. The pressure freezing process works on the vacuum free vapor compression principle. Explanation: Zarchin colt freezing process works on the vacuum free vapor compression principle. In this process, water is used as a refrigerant. 13. In which desalination process, solar energy is used? Explanation: In the solar evaporation, the solar energy is used as a source of heat energy. The solar energy striking the earth is estimated to be a 250BTU / day/m2. 14. The solar evaporation can yield about ___ kg of fresh water per day per m2 of basin surface. Explanation: The solar evaporation can yield about 5 kg of fresh water per day per m2 of basin surface under good sunshine conditions. The solar energy is absorbed by salt water and fresh water is produced.